Ok, here is another reason to love Chicago. Gabriel Levinson has created the “book bike.” Essentially, he rides around Chicago parks and neighborhoods and gives away new books for people to read. Levinson, who is a reviews editor for Make: A Chicago Literary Magazine, accomplishes this by working with both local and national independent publishers, such as Drawn & Quarterly, McSweeney’s, Farrar Straus and Giroux, Dark Horse, Soft Skull Press and Lake Claremont Press, to donate books to his cause. To read more about him and where he what park he will be at next, check out his website. Now if he would only make a trip up to Madison . . .
BTW, don’t you want to own one of these! 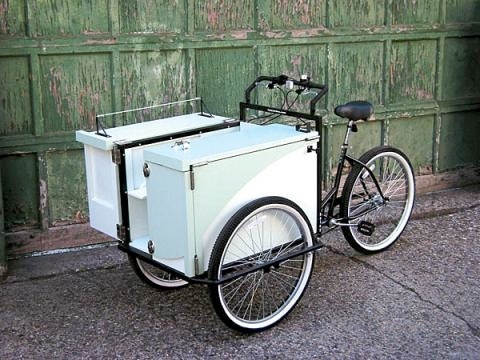 I could see myself using it to buy groceries, taking Walter for a ride, ha! « What to read . . .